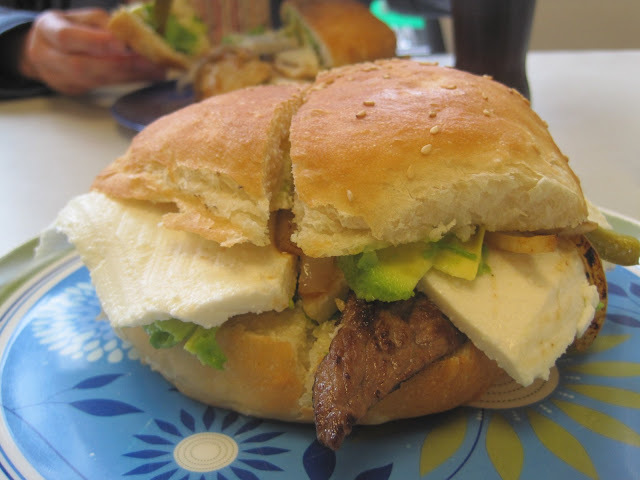 For my July roundup, I took the liberty of asking Eaters to salute their favorite sandwich — by naming the stuffed breadstuffs that form a more perfect union. I asked them to lay off the banh mi (recently discussed here) and leave out the burgers (for now). Battles raged. But I’m in it to win it — and did they ever come up with some winners. Did we miss the one that rings your bell? Feel free to raise the flag for your favorite, right here on the blog. Tat’s Delicatessen in Pioneer Square (now ensconced in new digs) is known for its East Coast-style steak sandwiches and subs (including “Chicken Parmesan so good that it hurts”). But I’m with the crowd who lose it over the Tat’strami. Why? Must be that “salty warm pastrami; sweet, cool coleslaw; toasted, chewy bread that absorbs all the juicy goodness” — including melted Swiss and Russian dressing. Tat’strami on the left, Philly-style cheesesteak on the right, fries in between — at Tat’s in Pioneer Square. Live up north? Try Barney’s Pastrami Dip, a hole-in-the-wall in Everett, and tell Mr. B you want his Pastrami Dip. Live East? It’s all about Mercer Island’s newbie Stopsky’s Delicatessen (pray for Wagyu pastrami, I’m told). This just in! Everything is better with bacon, and BLT lovers are all over the map on the subject. “The Swinery’s BLT is No. 1 in my book,” says a fan of that West Seattle butcher shop and sandwich stop. Another swears by the BLT at Lecosho on Seattle’s Harbor Steps — impressive for its addition of a soft-boiled egg and bacon-fat aioli! 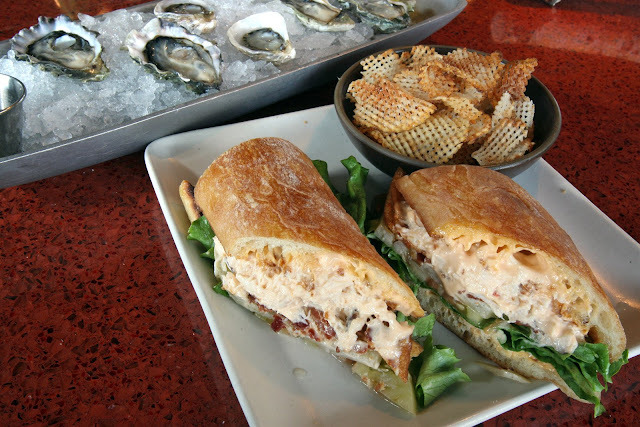 Dungeness crab and pickled green tomatoes elevate the BLT at Seatown Seabar & Rotisserie near Pike Place Market. And if you’re in the (Melrose) Market for a BLAT (add avocado and turkey), visit Homegrown, with sister sandwich stores in Fremont and Queen Anne. When I’m at Homegrown, I like to sample the seasonal menu. Here’s some summer fun: a prosciutto, burrata and melon sandwich with housemade chips, enjoyed at the Melrose Market location. How about a taste of Italy? Salumi Artisan Cured Meats, home to the Batali family’s Pioneer Square sandwich shop, rode in on a raft of love on that front. Grouse about the long lines, spare seating and sparse hours (note: They’ll close July 5-12 for vacation), but one bite of a sandwich built with mole salumi, porchetta, prosciutto, grilled lamb or anything else they’re slicing with a smile, and you’ll know why the legend lives on. Feeling Frenchy? 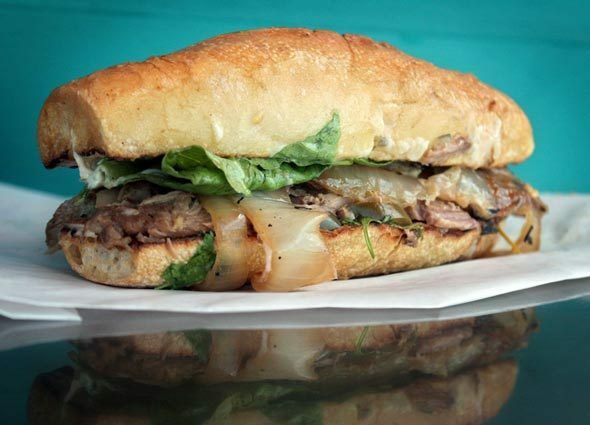 Grab some pork rillettes on a baguette at Picnic on Phinney Ridge. Need a Mexican fix? Seek out Cemitas Poblanas in Boulevard Park for the namesake cemitas: “giant round rolls filled with grilled meat, mild white Mexican cheese, plenty of avocado and grilled onions — delish.” German food’s the specialty at Bellevue old-timer Liebchen Delicatessen, where one admirer suggests the smoked roast beef on rye. Need some Rajun Cajun? Then high-tail it to The Other Coast Cafe, where that trademarked Cajun-style turkey sandwich — hot stuff at two locations, Ballard and Capitol Hill — has a fervent following. 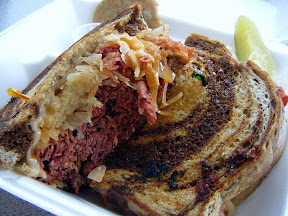 Reubens to-go, from I Love New York Deli (left) and Market House Corned Beef. Barbecue, anyone? Oh, yeah! Where to find it? In Issaquah, say those who lust after the smoked brisket sandwiches at Stan’s Bar-B-Q. In a Highland Park minimart, say fans of the pulled pork at Morning Star Deli. At Carolina Smoke in Bothell — where votes came in for the brisket and pulled-pork sandwiches. Many insist it’s “Pecos Pit by a longshot,” naming my picnic-table paradise in Sodo. “You know what’s in it” (beef brisket, medium sauce for me), “you know you love it” (I do), “it’s just whether or not you can finish the barbecued baked beans as well” (I can). 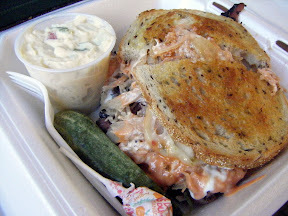 A sandwich from Pecos Pit BBQ? Readers say “Sign me up!” — and I’m right there with them. Don’t eat meat? Three cheers for the Husky Deli’s smoked tomato panini (Field Roast again) in West Seattle. While nearby in Georgetown, the vegetarian sub at Smarty Pants gets the nod. “I’m a devout carnivore, but the veg sandwiches at Georgetown Liquor Company are excellent,” says one of many fans of GLC’s Picard sandwich made with lentil-sage Field Roast. Think of it as a “vegetarian French dip,” I’m told, meant for dunking into a mushroomy jus. Did someone say po’boy? 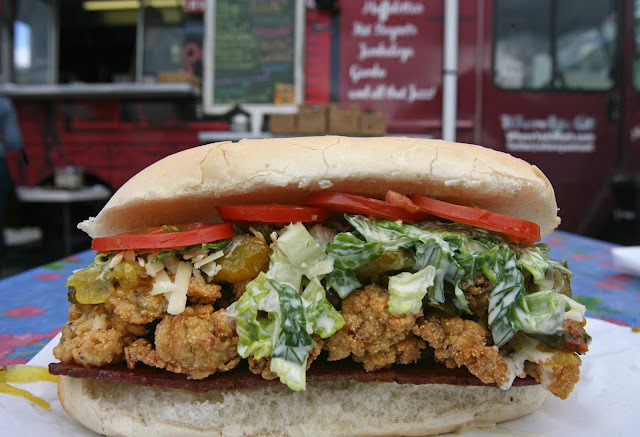 That’s one of the reason Seattle sandwich-lovers are chasing the Creole soul-food truck Where Ya At Matt all over town: They’re intent on getting their fists around such prizes as Matt Lewis’ prodigious po’boys, stuffed with catfish, shrimp, oysters or — my crying-good po’boy favorite — his Peacemaker. And put up a fight if you’d like, but I say it’s worth every cent of the $12 it costs, thanks to such illustrious ingredients as chubby fried oysters, Carlton Farms specially cured bacon, house-made lemon aioli and Mama Lil’s bread-and-butter pickles.